One of the most dynamic and inventive contemporary dance companies in the UK is coming to Husthwaite on Saturday 23rd March. It's a first for the village.......a chance not to be missed. 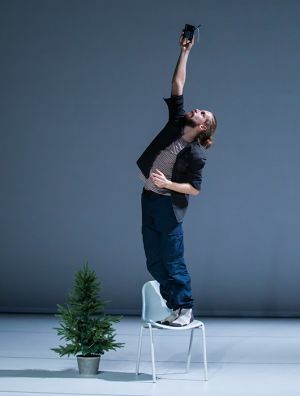 Thanks to Rural Arts in Thirsk (who subsidise arts projects around North Yorkshire) the best contemporary dance companies in Britain can perform in towns and villages. Joan Cleville Dance is based in Dundee, and they are truly remarkable. Their show is called "The North". Impossible to describe a performance which mixes music and dance with theatre and puppetry. But some of the press and audience reactions give a clue. "The piece is a lot of fun, with the added bonus that - as well as being fun, and having bits of dialogue - it's performed by people who (unless you're a trained dancer) can just do amazing stuff that you can't. And can do it without breaking a sweat, at the same time as doing all the normal stuff you can do. Which is a pretty excellent thing to go and see"
" "The North" was insanely beautiful, touching, funny and beautiful all at once. The movement was incredible, a truly amazing piece"
"Cleville takes the surreal into a realm that is both ridiculously entertaining and chillingly dark. Utterly more-ish"
Judge for yourself.....go online and Google Joan Cleville Dance The North. You'll see two trailers on the Vimeo website. I thought it was magical. The show is at the Village Hall on Saturday 23 March and starts at 7.30pm. Tickets are £10/£5 u18s/ £25 family (2+3). It's suitable for all ages and lasts an hour. With the dance space they need, there are fewer seats than normal......vital to book early. Afterwards, if you want, there's a half hour Q & A session with the dancers. Young people involved in dance at school will love the performance and the chance to talk to the dancers. Let me know if you would like tickets and I'll get them to your door.